Grab the goggles and inflatables and hit the oceanfront pool. Make the balcony your first stop in the morning and last stop at night. Pick up free DVD rentals, grab a few extra pillows and press "play." Play all those games you always think you'll play at home but never actually do. Located along a white-sand beach. Enjoy a refreshing daiquiri at the poolside bar. 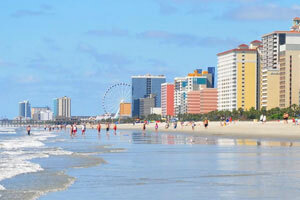 Paradise Resort is located in the heart of Myrtle Beach. Once you get settled into your condo, start the day off right with a visit to the on-site restaurant and breakfast bar (they have a DIY waffle station!). After breakfast, get changed into swimsuits, grab goggles and pool toys and cover the kids (and the grown-ups) in sunscreen. With an indoor pool, outdoor pool and 2 children’s pools along with a lazy river and 2 hot tubs, there’s no limit to the amount of underwater fun. The kids will be so happy that you’ll start to wonder if they are part fish. Stop by the poolside bar, The Tiki Hut, for a refreshing drink. One- and two-bedroom condos sleep eight guests, and three-bedroom condos sleep up to twelve. Full kitchens have everything that you need to whip up anything from quick snacks to multi-course meals. The kids will be begging to help make your famous chocolate-chip cookies (and be the official taste testers). In-suite washer/dryers (in most units) will come in handy if more chocolate ends up on the kids than in the mixing bowl. When it comes to in-suite entertainment, look no further than the flatscreen TVs with DVD players, they are perfect for family movie night. Bring favorite movies from home or browse the selection of DVDs that are available to rent at the resort. Pop some popcorn and call everyone into the living room. First kid on the couch gets to choose the movie. So what will it be – Cinderella or The Little Mermaid? Good news! The resort offers daily housekeeping, so that’s one less thing to worry about. Need more space? Upgrade to a deluxe condo. It’s just a short drive to Midway Par 3 Golf Course from Paradise Resort. Gather all of the golfers in your crew and get ready for a little friendly competition. Broadway at the Beach is the place to go for shopping, dining and entertainment in Myrtle Beach. Pick up a new cell phone case at MAXii Electronics. The Mole Hole has a variety of collectibles and gifts. Choose an oyster and create your own unique piece of jewelry at Pick a Pearl. Hard Rock Cafe, Joe’s Crab Shack and Extreme Pizza are just a few of the many dining options at Broadway at the Beach. Legends in Concert pays tribute to an ever-changing line of entertainers. Featured tributes have included Lady Gaga, Steven Tyler, Dolly Parton and Elvis Presley. The SkyWheel is one of Myrtle Beach’s best attractions. Board a large gondola (big enough for everyone in the family) and enjoy the incredible views at almost two-hundred feet above sea level. Ripley’s Odditorium is a must for fans of the “Believe It or Not” cartoons. Browse the personal collection of strange and unusual artifacts that were owned by the cartoon’s creator, Robert Ripley. Surprise the kids with a day at the Family Kingdom Amusement Park. It has almost forty rides and is just across the street from Splashes Water Park.